The UK is ploughing on with the roll-out of superfast broadband and while it will look like nothing has changed for a decade for those yet to see any benefit from the BDUK process with 88.9% of UK premises having the option of a superfast broadband connection at speeds of 24 Mbps or faster and importantly some 9 million have actually upgraded shows that things are changing. "In future, while there is likely to be an expansion in FTTP deployments, G.Fast will allow ultrafast speeds to be delivered over copper networks. Cable will also continue to have a role to play in delivering ultrafast services and the capability of satellite communications will also grow, which will be particularly important in serving hard-to-reach areas." The quoted paragraph is going to anger some, as it appears to be pandering to the G.fast plans of Openreach, but it does recognise that there are increasing amounts of FTTP in the UK, and actually when you look at the availability of ultrafast broadband there are more than enough areas for the analysts to survey and decide how much of a difference ultrafast broadband makes to the profitability of business and how it can improve home life. 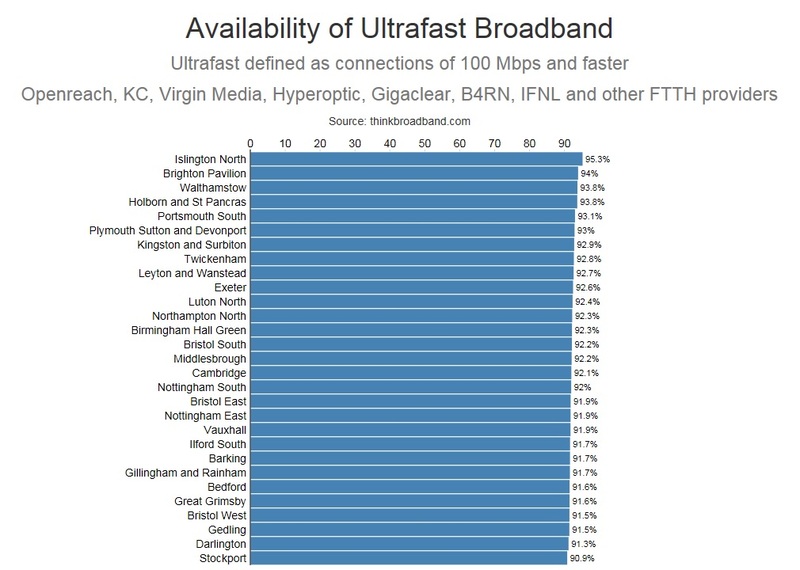 The top thirty Westminster constituencies show exceptionally high ultrafast availability and while the majority is from Virgin Media we are tracking the contribution of other providers. While ultrafast has a widely accepted definition of 100 Mbps (Ofcom prefers 300 Mbps) all the providers currently offer at least a 200 Mbps service, and in a year or two 300 Mbps will be part of the consumer Virgin Media line up and once DOCSIS 3.1 is deployed even faster speeds are possible, including Gigabit. Constituencies are generally areas with around 50,000 households, so viewing the coverage by local authority gives you an idea of which larger parts of the UK has high ultrafast availability. The overall UK picture is that ultrafast is available to 49.7% of UK premises, and we have just started to track the roll-out of Project Lightning by Virgin Media which just recently raised the cable providers coverage from 48.5% to 48.6%. The other 1.1% of ultrafast coverage is the combination of Openreach FTTP, Hyperoptic FTTB, KC FTTP and the longer tail of smaller operators (FTTH nationally is available to more than 1.1% of premises but some of these overlap with other FTTH providers or Virgin Media). So where will the UK be in 2020? Well the Virgin Media coverage may be in the 60 to 65% region, CityFibre plans vary between 5 million and 10 million FTTH homes passed, KC aims to have Lightstream available to all of Hull and both Gigaclear and Hyperoptic intend to keep on expanding, so ultrafast coverage out to 70%-75% looks achievable. The superfast BDUK projects might add another 1-2% of gap funded FTTH too (Gigaclear and Openreach) running until during 2017. If Openreach does go ahead with its G.fast/Fibre Premium roll-out it is very likely to largely overlap these competitiors but there is a chance that with no actual public money spent on the G.fast roll-out we could be looking at 80% ultrafast coverage across the UK. While we know that satellite broadband has a role in filling the sub 2 Mbps targets, the only way it could be considered as suitable for a lot faster is low earth orbit clusters rather than geo-stationary satellites currently used. The lower orbit is the only way to reduce latency and as the way we all use the Internet becomes more interactive this is critical. Fixed wireless, 4G and the mythical beast that is 5G does have a place in the mixture but if speeds of 200 Mbps are to become the norm (and not plumment to ADSL type speeds at peak times) then the mast density and frequency blocks available need to be utilised more efficiently or a lot more found by killing off more broadcast TV channels. As much as I would like FTTP right now, I know it ain't happening soon. If G.fast would give FTTP type speeds reliably I don't care what kind of cable is used. > While we know that satellite broadband has a role in filling the sub 2 Mbps targets. The uptake will depend on the price the end user has to pay, i.e. if it is more expensive than FTTC not many people will think it's worth it. From my experience of Sat BB some years ago I'd rather stay on 3Meg CTTP. The Government clearly considers that its role in the Broadband market is winding down. In BT commercial areas it will in reality have little input and it is up to BT if they use G.fast or FTTP likewise with other providers. In the BDUK areas I guess that this will be more or less as good as it gets - BDUK phase 2 has very limited ambitions. Those of us who have missed out are left with Satellite or if we are lucky commercial Fixed Wireless. However, as the failings of FTTC become clear the Government may be forced into repeating the whole saga again for G.fast - maybe in 5-10 years? Governments should, generally, legislate "what" and not "how", be it for broadband speed, tailpipe emissions or anything else. They're not engineers. Any technology beyond wood is likely to baffle them. I'd be delighted to get 100Mbps but why would I care how it is delivered so long as it is stable & reliable? I am sure the government take advice from people like the BSG and evidence from VM and BT amongst many others. They will be aware that it's unlikely there will be a need for more than a fraction of a percent of premises to be using speeds out of reach of hybrid networks. From their point of view if the case for the levels of performance only available to FTTP is so strong why do the majority who can receive >=100Mb take 50/70, and the majority able to receive closer to 80Mb purchase 40? BT and VM are doing just in time CapEx. For the overwhelming majority, those who don't browse specialist websites and forums, or test their broadband speed avidly as I seen someone claim they do this is quite adequate. Neither end users or OLOs have a desire to pay big supplements for FTTP. Even the highest forecast for required bandwidth, using some pretty absurd estimates for usage of applications and including home working, doesn't forecast a requirement outside of the performance G.fast will produce. I think that it is important to point out that G.fast will only deliver the expected benefits if the cabinets are close enough together. To expect BT to deliver a uniform fast service throughout the coverage area is clearly not realistic and pie in the sky in rural areas. @chilting and the quarter when Virgin Media fastest speed tier is their most popular will be the day when Openreach changes tack and increases FTTP ratio. UK has 48.6% of premises it can use as a study for what speed people need and will actually buy. And no-one, not even those with vested interests in selling equipment, claims G.fast will be inadequate for needs in 5 to 10 years' time. Please read the Nesta link above for more information. Those with vested interests are usually the least able or least willing to spot changes in any market and particularly in technology. Take IBM, Compaq, Yahoo for example. A consultation for 5-10 years needs to start with figuring something about today: Is the current market still plagued by technical limitations, where consumers cannot reach their minimum desired speed? If it is limited, the approach should focus on removing those limits (such as by use of FTTP). If the market is not limited, then it is better to understand existing use, and forecast forward. And then work out if technical limitations will come back into play. It strikes me that the UK is about 10% of the former - technically limited - market, and about 90% of the latter. Within the 10% who are currently technically limited, there is probably a small proportion which are limited by VM's top speed, and would like more, but the larger proportion who are failing to get their needs met at the bottom of the market. FTTC and Docsis 3.0 currently, with G.fast and Docsis 3.1 to come, aren't solutions for everyone - but they are perfectly suitable for the majority. Demands for FTTP for all, as a way to solve the trickiest few percent, are doomed to fail when 90% of the market has absolutely no need for it and no desire to pay for it. I sometimes wonder if FTTP campaigners are doing the same as army generals: committing the sin of "fighting the last war". For a good chunk of the last 15 years, broadband has been a commodity where the speed limitations have been insufficient to meet the end-user's demands. 7 or 8 years ago, demand for FTTP was widespread because it was the only solution. Nowadays, two crucial things have changed: FTTP is no longer the only solution. And end-user demand is being satisfied to a huge degree. The future war looks nothing like the way we thought it would. Time to change tactics? Those wanting to sell hardware to deliver bandwidth are going to deliver information underestimating bandwidth requirements? Institutions representing cable companies are going to offer up reports indicating that people may not actually need cable but the telco's products are okay? Perhaps actually read the link rather than simply trying to justify your own opinions. You're coming across as being intentionally ignorant for fear that the evidence will contradict your own beliefs. @dixinormous I did read the link - the assumptions explicitly rule out new technology. Given that no one can predict what these are going to be I think we should be taking the Bazalgette approach to infrastructure building. @wwwombat I have never suggested FTTP is the answer, and indeed have said in the past that fixed solutions are not the way forward in an era of continuous connectivity. As far as the preferred package tending to be the lowest and cheapest available I looked back at the subscriptions for our community broadband service in 2004. 95% took the 256Kbps option, 5% the 512Kpbs one and only one subscriber each took the 1Mbps and 2Mbps ones and the latter were both businesses. The highest forecast included 100Mb/s symmetrical for cloud services, 25Mb for HD communications, and a bunch of other things operating on the presumption of home offices. It still came to less than 400Mb. Usage has increased because of constant demand via video and concurrency, not because of massively bursty bandwidth requirements. Video has actually improved in efficiency for the same quality. What else is there beyond video and concurrency? Star Trek style transporters? 50Mb is fine for 4k. You expect 8k to be widespread in 10 years? The preferred package is the lowest and cheapest available that does what people want it to. There is a rather big gap between a 40Mb VDSL service and ADSL services that deliver <10Mb. Virgin Media don't even offer a service below 50Mb. The applications requiring >10Mb are clear. Concurrency and HD video. There is absolutely no reason and no-one who isn't high has suggested that 2Gb/s will be the average requirement in 12 years time. Strangely for these amazing new technologies none have appeared between 2000 and 2016. Just more people doing more of the same basic things. And in another 12 years it will be another 80 times higher clearly. The driver might be how long will people wait for a 200GB digital game to download? Or maybe you won't download at all, but rather stream a UHD stream from a render farm at 40 Mbps when playing. I'm more confused by the idea that the assumptions made in that paper render it meaningless but assuming that some applications will appear in the next 10 years necessitates skipping a generation in access technologies. Or that the FTTH council are way out forecasting 350Mb/2 by 2025 despite wanting to sell hardware. Data networks aren't like sewer systems. You can't re-use half of a sewer system's CapEx to increase its capacity you have to re-do from scratch. Virgin Media will likely adopt the same JIT approach. I don't own anything that can connect at over 1 GBps and most things connect at under 50Mbps throughput (wireless). Were I to upgrade to a faster LAN technology I would still be constrained by server farm capacity for downloads ? Try applying Neilsen's law and see what results you get for 2025. BT can off course get a lot more speed out of their FTTC network by removing ADSL. This would also extend the range towards the final 5%. Maybe this will happen over the 5-10 year period? For 2016 it should be >300Mb. Though of course this only considers early adopters with deep pockets and is nothing to do with actual requirements. I'm not convinced 500Mb will be a mass-market product with a large uptake in 2017 or 300Mb this year. Granted, but in the longer term the older technology will need to be replaced. It is something that interested parties should debate sooner rather than later. Nielsen's 50% really applies to the top 1% user ... who perhaps should fork out for high-end bandwidth on his own. The growth rate for Joe Bloggs is more like 25%, which paints a different picture for 90%. There, 500Mbps is fine. source of the 50% Nielsen’s Law growth. It turns out that this will be flattening out over the next decade ..."
One problem with Nielsen's law is that it is a statement of the bandwidth available to top-end users, and is not a statement about how much of it they'll use. I'm content that we could see the current applications that use high bandwidth - HD video - back in the nineties, even if we had no clue "when" it would hit mainstream. I don't see any new application that would demand higher bandwidth, and be applicable to mainstream users. I agree with Arris - that video demand will level off, helped by the more efficient video coding. And therefore total demand per line will level off. "fixed solutions are not the way forward in an era of continuous connectivity"
Except, of course, that "continuous connectivity" needs backhaul. The more ubiquitous you want it to get, the more pervasive a fixed-line solution needs to back it up. Of course, the fixed-line portion of the connection becomes less obvious to an "always on, always connected" device (or person), but that doesn't mean it disappears out of the equation entirely. G.fast for the masses with FoD for that group Nielsen's law refers to who want the extra capacity and will pay for it. There's obviously a chance that a new application will appear that takes everyone by surprise, but certainly there's no business case to build new networks based on it. The trouble is that it won't be for all the masses, those of us in BDUK areas wont see G.fast unless the Government dig deep again and FoD will never be affordable. Our exchange covers 20 square miles with just 2,000 lines - giving us G.fast would simply not be viable even if it were technically possible. How does 300Mbps actually help the ordinary home user? I guess if it was a household of 4 simultaneous users 4x6Mps might be useful. But 300Mps! What are people doing? Driving 3D printers over the internet? Engaging in some highly "immersive" hyper-reality? In all the plannimng for future BB systems, they must take account of the move away from RF broadcasting of digital TV towards delivery via internet. With the growing use of UHD (4K) and possibly greather definition in the future, allowance must be made for the heavy data demanded by such services, especially if a household has several UHD or better TV sets. ADSL just cannot meet that level of demand at present. FTTC might for some, FTTP should with good technology being used. But will the internet backbone have enough capability? From a very rural perspective the problem with G,fast is that BT/Openreach will be able to use it as an excuse to do nothing about the existing copper network. No maintenance is done and repairs to the copper network are desperately slow in this area, 16 premises being without service for 2 weeks in the last instance. What is needed is investment on the means of delivery, whatever they may be in the future. 4k TV sets might be getting common, but 4k content will be much slower to grow. We don't like paying extra - DVD SD sales still outstrip Bluray HD. Treat it as niche for a long time. And backbones only need to cope once it isn't multicast. Conclusion: by 2025, a busy family could have a sustained peak-hour demand of 50Mbps for evening TV. But also an elastic demand that could occasionally peak at 500Mbps. The latter looks to be driven by one-off console downloads - presumably by impatient teens. Draw your own conclusion about how many households would stick nearer 50Mbps, and how many would go for 500.